Doing the Parenzana trail had been on my to-do list for a long time – the whole 123 kilometres of it! Though it's possible to cycle the whole length of the trail in one day (and many people do), I wanted to take things slow and enjoy the ride and the scenery along the way. So I planned to do the trail in several stages, partly on bicycle and partly on foot. 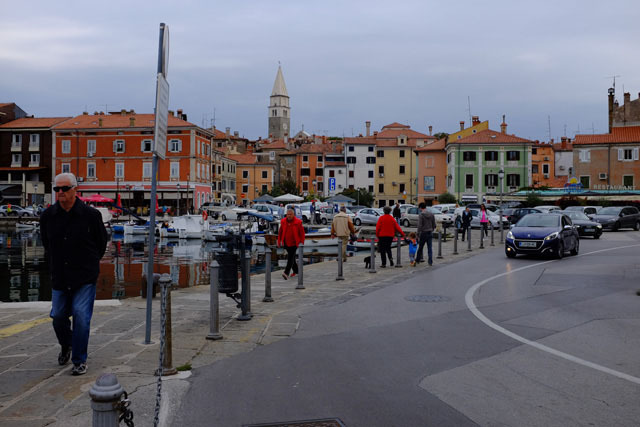 This walking and cycle trail runs along a former narrow gauge railway line built during the Austro-Hungarian Empire that operated from 1902 to 1935 and once linked the port city of Trieste (in Italy) to the coastal town of Poreč on Istria's western coast. 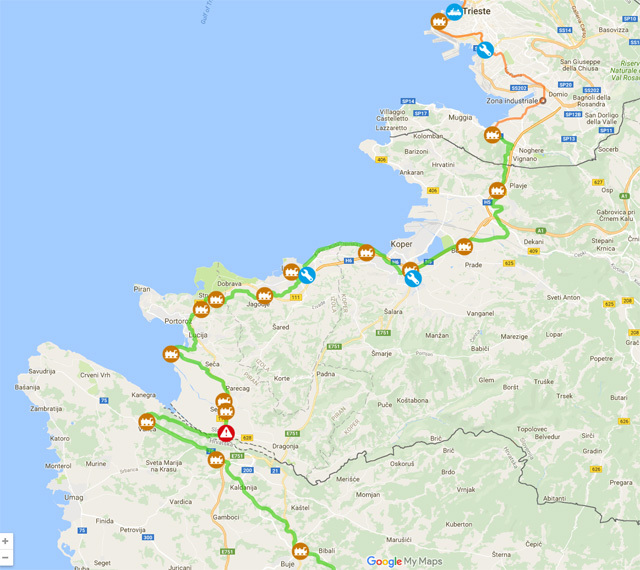 After a bit of research, I decided to cycle the first stage of the trail starting in Muggia, Italy, through a small part of Slovenia, and across the Croatian border to Buje. 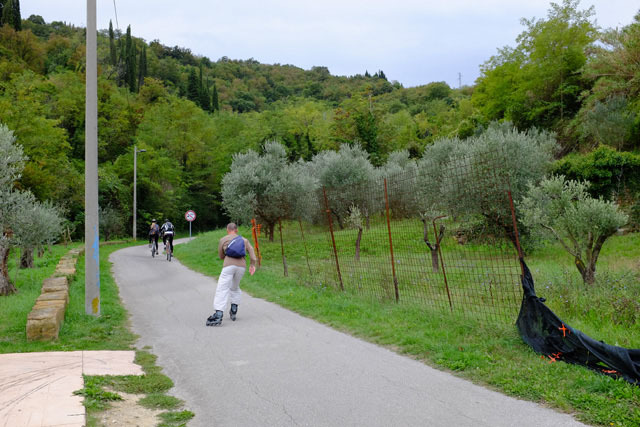 I read that this part of the Parenzana that runs through Slovenia is paved, and more or less flat, so ideal for cycling. Though the railway line used to run all the way to Trieste, the section from Muggia to Trieste has not been converted into a trail. 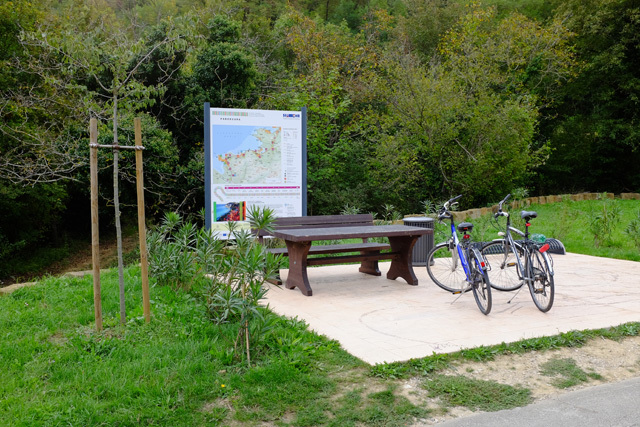 So on a warm October day I started my journey in Muggia (15 km from Trieste) where the Parenzana trail starts. 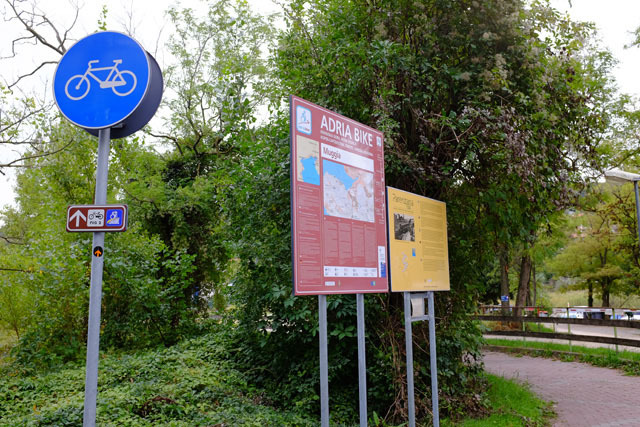 A sign here marks the beginning of the trail, which is also part of a longer bicycle network called the Adria Bike route that begins in Ravenna, Italy and follows the Adriatic. The trail started idyllically enough through a woody stretch along the Ospo River, and then over a bridge. But all of sudden we found ourselves on a traffic circle with no clear sign of which way to go. We followed a group of equally confused Italian cyclists and eventually found the path again after going up an incline and through a residential area. We continued along a wooded path and quickly came to the border with Slovenia which was simply marked with a sign. It was an easy ride to the port city of Koper on mostly flat roads. 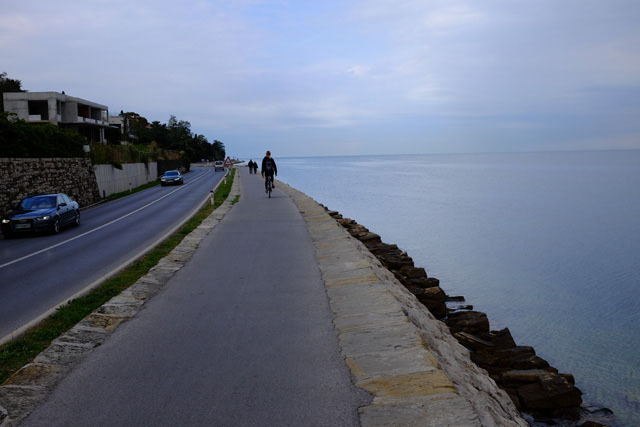 After a stop in the old town for coffee, we returned to the trail which followed the coastline along this stretch all the way to Izola. There's an original locomotive that was used on the Parenzana railway on display here with a few interesting facts: it was specially constructed for the railway, and could hold 3m3 of water and 2m3 of coal. 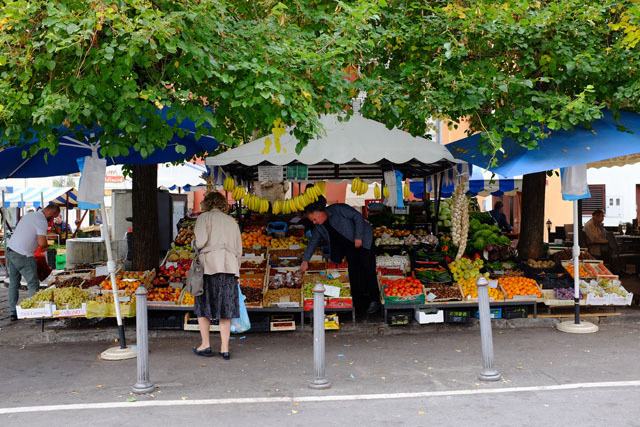 We took a detour here to visit the charming old town, and came across the fruit and vegetable market on the way. 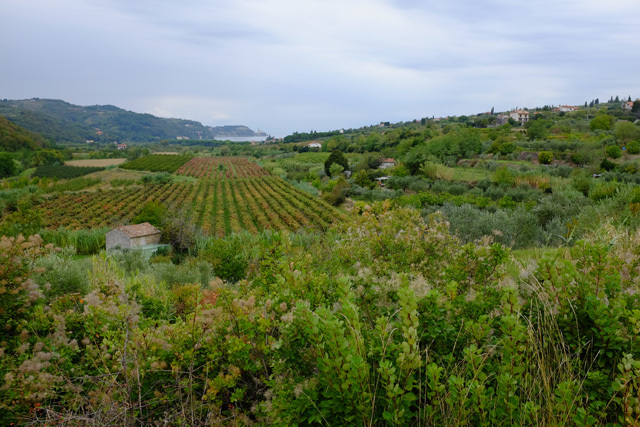 From Izola the Parenzana trail leaves the coast and climbs upwards to the hills of Jagodje, with plenty of olive groves and vineyards on the way and sweeping views of the sea and Izola's old town below. We soon came to the first tunnel on the trail at Šalet, and passed through more idyllic landscapes of vineyards and olive plantations with the seaside city of Piran visible in the distance. 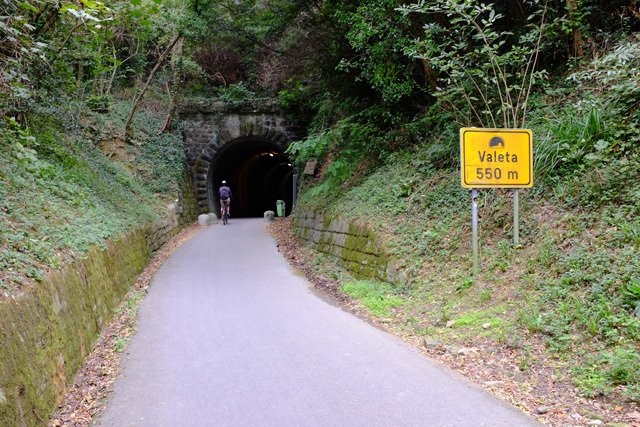 We quickly reached the second tunnel at Valeta: at 550 metres in length, it's one of the longest tunnels on the trail and was fortunately well-lit. On exiting the tunnel we saw that we were in the hills above Portorož, another well-known Slovenian seaside town. After descending the hill we came across a different landscape once again. Stretching towards the sea was marshland divided into rectangular ponds and painted in tones of rusty Autumn red. 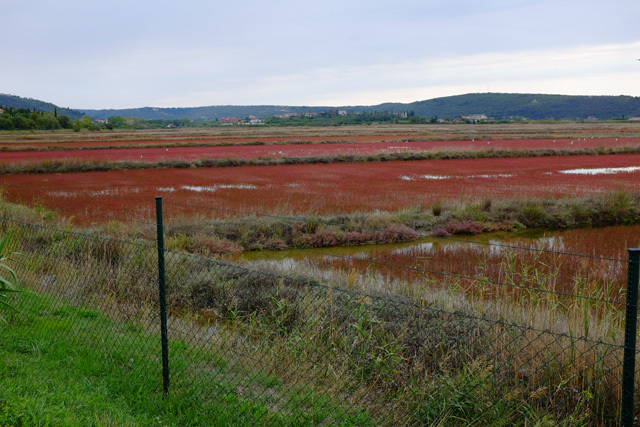 These are the Sečovlje salt pans where a saltworks has been in operation since the 13th century. Salt production continues here but on a smaller scale, and this is also the site of a nature park which is home to many bird species, and a museum of salt-making. From here it was just a short ride to the Slovenian-Croatian border. This was my first time crossing a border on a bicycle! We showed our id cards to the officer and once over the border, we now faced the most difficult part of this stretch: the uphill climb towards Buje. A sign gave us two options: straight ahead, or a path off the road to the right. We continued on ahead, not knowing that the path to the right around a hairpin bend was the original path of the Parenzana train. Maybe that path was longer but easier, but it eventually merges with the main road on the top of the hill, which we followed on our way to Buje. Compared to the narrow paths we rode along in Slovenia, riding with traffic on a main road was definitely not as picturesque, but a sign soon pointed us to a secondary dirt road that ran parallel to the main road and eventually took us to the hilltop town of Buje. This is where the first stage of my trip on the Parenzana trail ended. Overall this stage of the Parenzana was an easy and enjoyable ride, and I would love to experience it again. 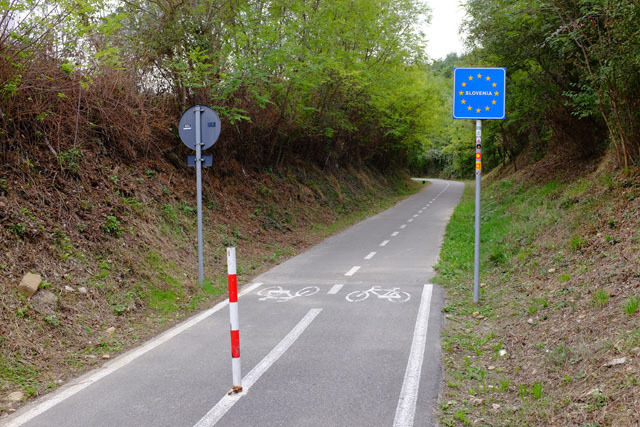 The Parenzana trail through Slovenia is paved (except for a short stretch of maybe 400 metres during the climb towards Jagodje) and is well-maintained and sign-posted. There are also several rest areas along the way with picnic tables provided. At each place where there used to be a station, there are signs with information and facts about the railway, nearby sights, and the station buildings.